Description Highlight changes in movement and direction of a dip field using a Sobel operator. The Edges process highlights changes in the movement and direction of the vectors in a dips volume. It is one method of visualising discontinuities based on structure, i.e. 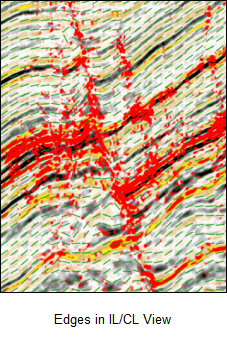 faults and flexures. The process uses a Sobel operator to identify the changes in the dip vectors. 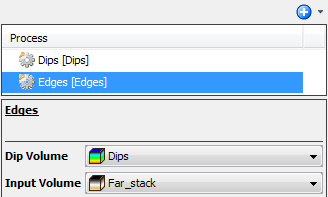 In the Details Panel, select the dips volume from which you want to generate edges at Dip Volume. At Input Volume, select the volume that you want to show the edges. As a result of this process, a new volume is available in the Volume tab. Like Dips, it is typical to display Edges over the input data in a group (see Creating a Group) using a semi-transparent colour bar.